Ahhh, perfect lighting at last! EVERY Sunday from now until my dying day. What do ya say…drooling yet? 2. In a small bowl, stir together flour, baking powder, and cinnamon. 3. 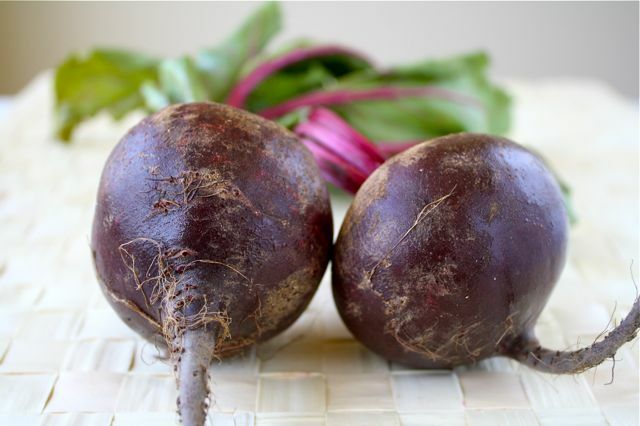 Combine grated beets, milk, extract, and sweetener in a blender and puree until smooth. 4. Whisk egg white until frothy (about 30 seconds). 5. Add whisked egg and beet mixture to dry ingredients and stir until well combined. 7. Pour batter into skillet or griddle forming two medium-sized pancakes and cook 5-6 minutes per side or until edges start to crisp. 8. Plate and top as desired. They came out PERFECTLY…you can barely even see the difference! 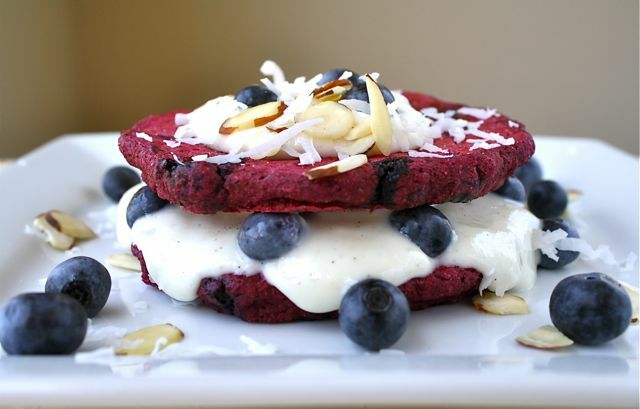 This entry was posted in Breakfast, Pancake Sunday, Vegan, Vegetarian and tagged almonds, beets, blueberries, coconut, Greek yogurt, pancakes, protein powder, recipe, veggies, whole wheat pastry flour. Bookmark the permalink. interesting! hmmm…will Travis go for these? 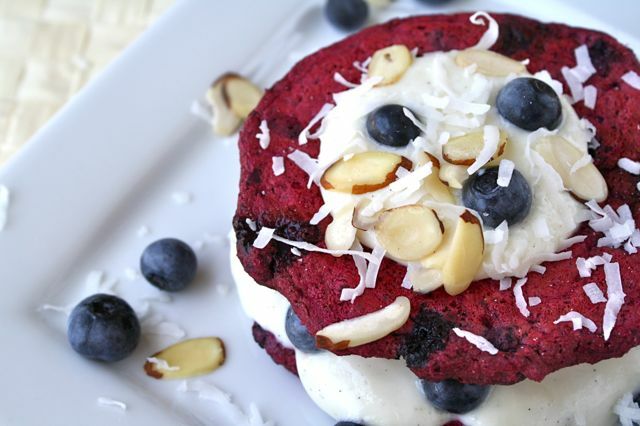 might have to call them red velvet pancakes. haha thats a damn good idea! otherwise im pretty sure my husband would never be on board! i just so happen to have beets in the fridge right now! 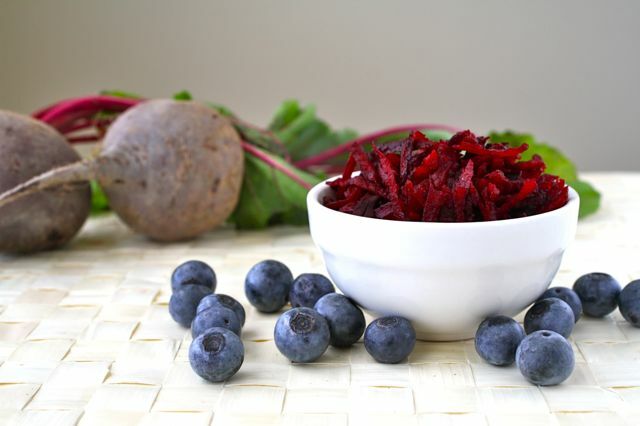 blueberries and beets…that’s an insane combo. Love it. These look so good! I’m glad Luvy is color blind so he maybe won’t realize his pancakes are red! Hopefully I can slip this by him! Beautiful!!! Such a wonderful idea. Or change the blog name to “Kiss my pancakes”!! Drooling indeed! 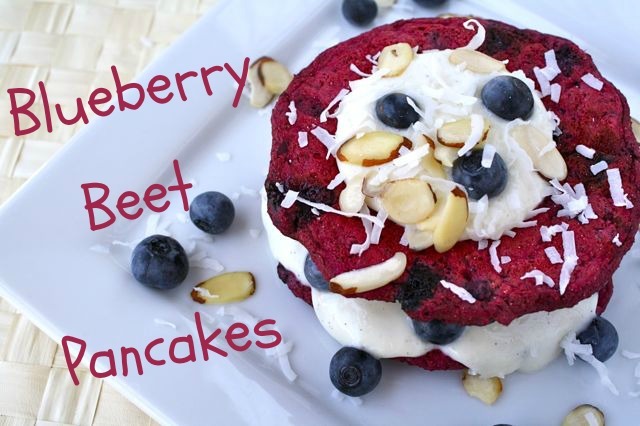 These are so bright and colorful – I love that they’re beet based (I love beets). james loves beets. like too much. Peeing red perhaps? Omg, THAT’S what it is!!! Dude, I never knew that, but umm…I was a kinda wondering! Hahaha! Why are you so amazingly brilliant? And can I crash your house next Sunday? recipe to make me eat anything you make: add beets. YUM. 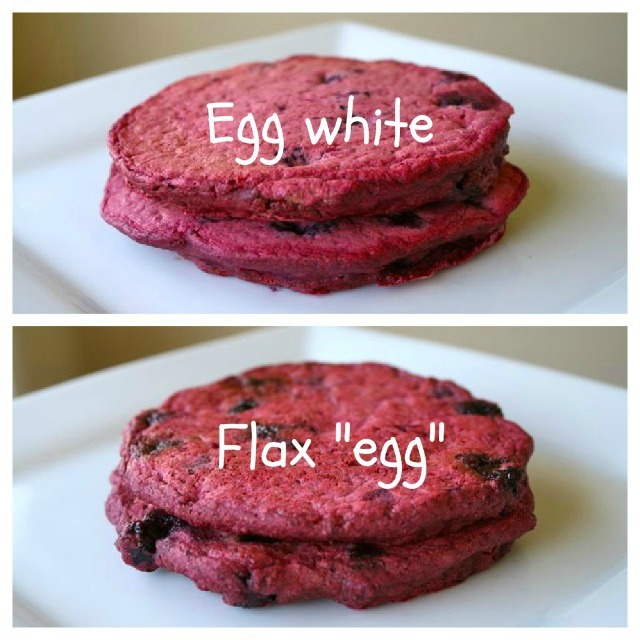 I love that you compared the flax and real egg! 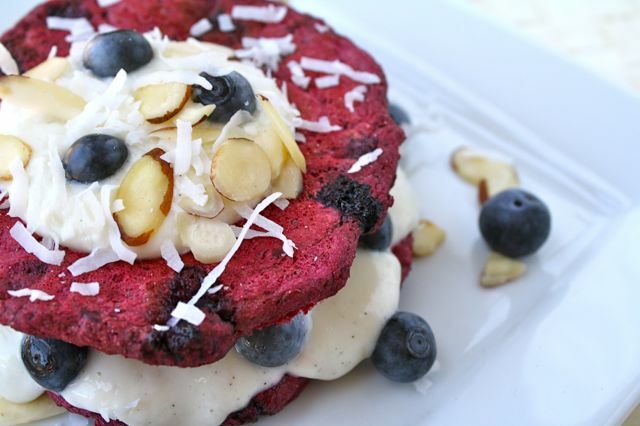 The pancakes look like one big delicious purple sandwich. Again I ask- why can’t you be my neighbor?? you’re so creative! 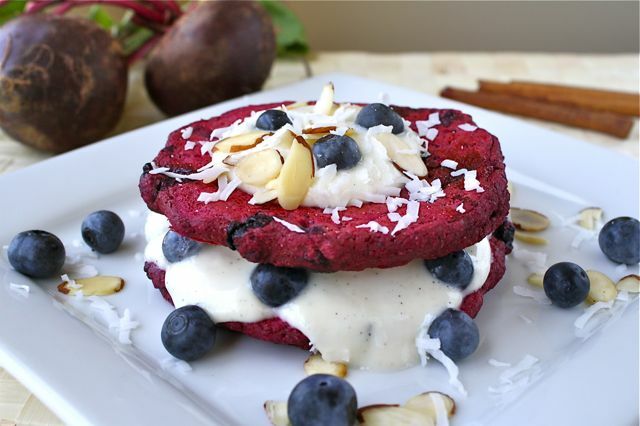 i think i need to try these…i have no excuse bc i just picked like 30 beets from our garden…beet pancakes it is! Woo hoo! You gotta let me know what you think! Wow! Those look great! I am afraid of beets and their mess so I’ve never cooked with them, but I love them. Did you just grate it raw? Any tips to stay clean and not stained? i gotta buy some beets! this recipe looks fantastic! 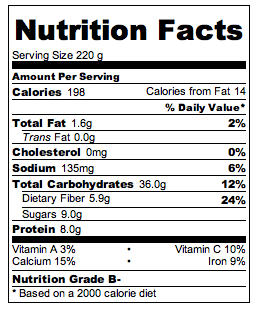 This might be a silly question, but what’s the difference between “wheat pastry flour” and just wheat flour? This sounds yummy, but would wheat flour work just as well, so I don’t have to got buy anything else? Or try to track it down… Thanks! No!! Not a silly question at all! The difference between PASTRY flour and whole wheat flour is the amount of gluten it contains. Pastry flour has LESS gluten…think pastry, like tender cookies and soft bread. Gluten helps ingredients stick together and gives baked goods a chewy consistency. Once gluten comes in contact with liquid (and air…while stirring), it starts the binding process. The longer you stir, the stronger that bond becomes. That is why you see recipes that state not to over-stir your batter…the more you stir, the chewier and denser the end result will be! Oh my gosh, Katy! Thank you so so much! You really just made my day…I LOVE to hear when people try my recipes but the fact that you also made these for your kids…AND THEY LIKED THEM?!?! Seriously? I’m ecstatic!! And now…I want to make them for myself! Haha! Hope you are having a fantastic weekend!